When I first began to work with my hands (around the age of 15, when I began to crochet, and then knit), I had an odd impulse to limit how far I planned on learning a particular craft. 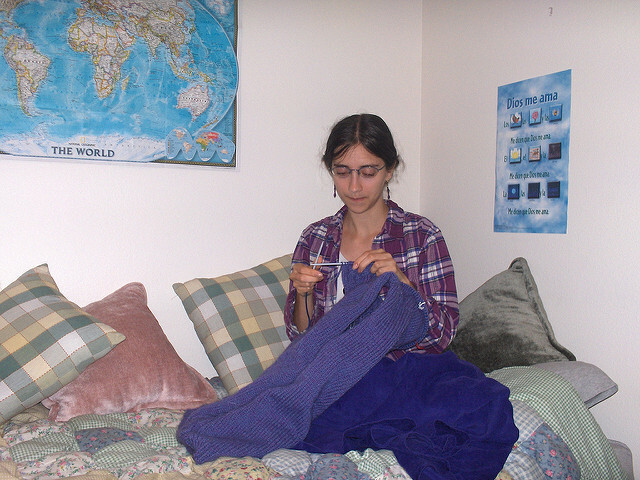 When I learned to knit, for example, I devoted myself to simple items like scarves, hats, and mittens, resolving that I would never make anything as large as an afghan, or as complex as a sweater. When I decided to learn to spin yarn, I made a point to tell everyone I would never take up weaving, as that seemed far too great a commitment of time and resources. I’m not entirely sure why I felt compelled to curtail ambition in these ways — perhaps I was trying to convince myself that these crafts were merely hobbies, something to keep my hands busy while I watched a movie or chatted with friends. It’s possible I was trying to normalize my craft, and not appear eccentric (though this is unlikely, given my other cultivated eccentricities as a teen). Or perhaps, like so many clever, well-praised girls, I wanted to protect myself from more difficult challenges that might lead to failure. I was in college before I decided not only that I could make a sweater, but that I must. It was a lesson in patience and humility, and I felt, somehow, more myself, more a person, when I took on that large thing and struggled to complete it. College Bethany, captivated by a new skill for hand and eye. Despite learning this lesson with knitting (and, more recently, sewing), sometimes fear still overcomes proper ambition, and I shut doors against new skills. Most recently, this happened with weaving. I am still very much a novice weaver. I’ve had a rigid heddle loom for some years but am still quite basic in my abilities. I’ve also received a beautiful little 4-shaft loom, but, living in an RV, I haven’t had a space to set up and learn how to use this loom. There are actually a number of forms of weaving that can work well in a small space, among them rigid heddle weaving, inkle-loom weaving, and tablet (or card) weaving. Of these, tablet weaving produces the patterns that attract me most – beautiful, intricate designs. Rigid heddle and inkle weaving work best with only two groups of threads moving up and down, producing fairly simple patterns. Tablet weaving can do as much as or more than a more complex loom, since each tablet holds four threads, and the cards themselves can be moved independently of one another. I finally decided to try tablet weaving because I was beginning to lose my interest in weaving, impatient to find a place for the 4-shaft loom and the patterns it could create. Tablet weaving, I was learning, could produce such patterns large or expensive equipment. A pack of playing cards, a pair of scissors, and a hole punch provide the essential tools. I used this tutorial to make my first set of cards, and as soon as I began weaving, I knew I had once again stepped through a door that once seemed fearful. After a steady hour of careful warping and threading, it felt like magic when I first turned the cards and saw the pattern begin to form. Using a backstrap set-up, I loved the sense that my whole body was participating in the necessary stretch and tension of the loom. Well before I was done with my first band, I was researching new patterns, reading the history of the craft, and plotting how to make more durable cards (my 88¢ playing cards have, after only a few projects, begun to wear out). 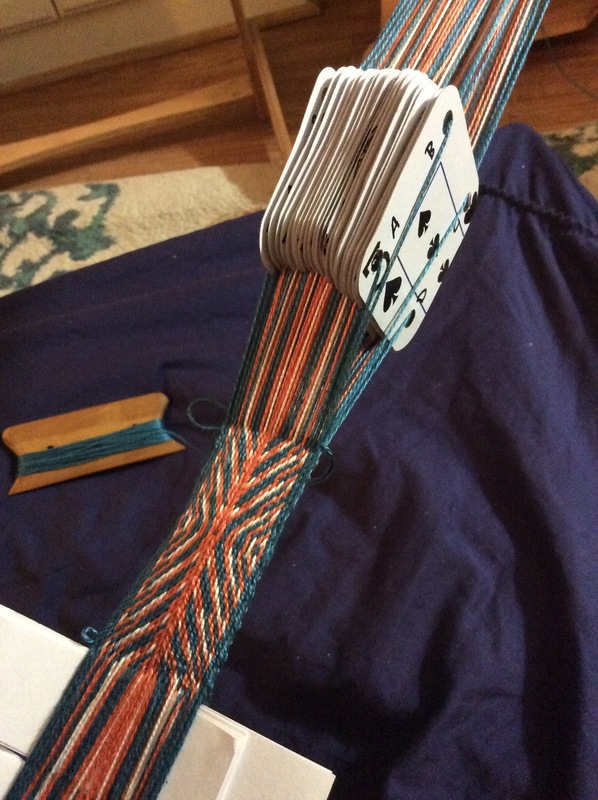 The second time I warped my cards, rather than simply following a pattern, I let myself experiment, testing how the threads twined round one another, and what happened with different arrangements and ordering. I’ve even started to invite my neighbors to learn, seeing the potential for such an inexpensive form of weaving to flourish in a community built for the poor. My husband is probably not the first weaver’s man to find himself trapped by his wife’s warping. Wonder. Curiosity. Courage. All these are signs that a craft has overcome my fear, and is leading me into something larger than myself. Learning tablet weaving–once on my silly “never ever” list of crafts–has reminded me that without hope and without risk, we cheat ourselves from the discipline of virtue, from gifts essential to human flourishing. If you’d like to try tablet weaving (or card weaving, as it is often called here in the US), I’ve added a new section on weaving to the Whole Cloth Resources page. You can find several links and books to lead you aright. Whether you are a weaver, woodworker, seamstress, or student of some other good work, I encourage you to examine the hopes and fears you have for your craft. Take a step toward the fearful door — there is a good chance you will rest and good company on the other side. I remember when I first took up woodworking, I saw that some guys were not only making cool wooden furniture but even making their own tools. I thought to myself, “I’ll keep getting better at woodworking, but I’ll never be able to make my own tools!” A decade later, I’ve made several of the tools now in my toolbox. With woodworking, there are definitely a number of different rabbit holes that one can fall down (joinery, turning, lap carving, relief carving, marquetry), most of which require a significant investment in specialized tools. So I’ve had to limit myself in that way. But it’s no longer out of a fear of failure or a lack of confidence. If I get interested enough in another aspect of woodworking, I’ll figure it out eventually.